A set of four quality front brake wheel cylinders for the Morris J Type & JB vans. M.G. TD, YB, TF, Midget. Morris Cowley, 1/2 ton van. Morris Oxford, 13.5hp. Morris Oxford, Series III. Morris Six, 21hp. Morris Isis, Saloon, Series II. Morris Hindustan, RHD. Morris J2, 15cwt from chassis number78488. Morris J Type Van, 1953-1956. This sale is for a new boxed brake master cylinder that fits the following vehicles. 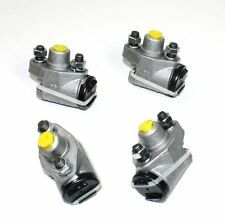 A set of four top quality front brake wheel cylinders. OE Numbers were 35000 & 35001 left & right handed. Marina - 1. 8 - from 1970 to 1980 AUSTIN. Maxi - from 1971 to 1982. SHOE FITTING KIT. We are a family run motor factors in Midlothian, Scotland. Our staff have over 50 years cumulative experience in the motor trade with one of us specialising in Ford parts and have access to old microfiche for Ford O.E.M parts numbers. MORRIS 8 SERIES E. 1938 TO 1948. REAR BRAKE FLEXIBLE HOSE. Part number for reference: TT3949. AUSTIN A30, A35, A40 MK2. MORRIS COWLEY 12/4 AND 15/6, 1935. FULL SET OF NEW BRAKE HOSES. I AM UNAVAILABLE TO PROCESS ORDERS FROM THE 14TH SEPTEMBER 2014 UNTIL THE 5TH OCTOBER 2014. ORDERS CAN BE PLACED ON THIS BASIS ONLY. RILEY KESTREL MK 1 AND MK2. Here's a pair of newFront Brake Calipers (x2) for the following models fromAustin / Morris -. Austin / Morris 1800cc ( From Mar 72- 75 ). They used different calipers(Imperial) before Mar 1972. (Not for 'S' version, 2200 or 3 Litre which used x3 pot calipers). Manufactured by Borg & Beck. We buy direct from Quinton Hazell, Firstline, Gates and Borg and Beck making us Midlothian's only authorised dealer of Quinton Hazell parts. Minor 1000 & 1100 - from January 1962 to October 1971. They have been dismantled, checked and reassembled with fresh red rubber grease and are ready to fit. Thread = BSF. Goodridge brake hose kits feature the finest quality hose, consisting of a PTFE inner with a stainless steel outerbraid. This eliminates the spongy feel under arduous conditions, giving greater brake operation as well as providing superior resistance to abrasion and corrosion. Thread = BSF. Goodridge Classic brake hose kits feature the finest quality hose, consisting of a PTFE inner with a stainless steel outerbraid. This eliminates the spongy feel under arduous conditions, giving greater brake operation as well as providing superior resistance to abrasion and corrosion. Morris Minor (1948- 62 Only). I can do much more on the phone. Here's a set ofFront Brake Shoes (7") for the following models fromMorris -. (Only for these years and only for the Front). JUST BELOW THE ITEM PRICE. Modèles à transmission droite que nous avons des plans pour, si le vôtre est nous aurions besoin de connaître les longueurs des deux tuyaux pour le servo de commande de main gauche. Tous les tuyaux en kunifer frein de canalisations, testé à la spécification de sécurité. A set of four top quality rear brake shoes. Morris 12hp Series 3 (1938- 39). Morris 10hp Series M (1939- 47) (Includes Utility). Morris 12 hp Series Y (1945- 52). You need x1 cylinder per rear wheel, if you want enough for both wheels change the quantity to x2. LD5 AND LD05. 1963 TO 1968. A set of good quality brake shoes for the Morris Minor. Fits the late 803cc cars and all the 948cc cars. Asbestos free. UP TO Chassis 228267. Morris Minor Series 2. Front DRUM BRAKE. (1 per Wheel Cylinder). WHEEL CYLINDER SEALS. 4 x Wheel Cylinder SEALS. Top Quality. It should not be altered / tampered with/used. MORRIS MINOR. NEW FRONT BRAKE WHEEL CYLINDER SET OF 4. MORRIS 8 SERIES. NEW BRAKE HOSE SET. SERIES 1 AND SERIES 2. For RHD Cars. Morris Minor 1000. These brake pipes are manufactured in copper and supplied cut to length and flared with brass fitting. (Copper Pipe with brass fittings). (C/W BRASS FITTINGS). Brake Fluid will boil when saturated with water. Austin / Morris J4 Van. Here’s a new set ofFront Brake Adjusters (x4) for the following models fromAustin -. AUSTIN / MORRIS. I can do much more on the phone. JUST BELOW THE ITEM PRICE. DO YOU WANT A.
Morris J2 (15 Cwt Van) ( Chassis. 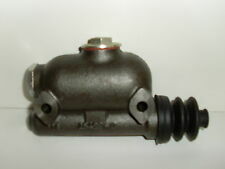 Here's a newBrake Master Cylinder (1") for the following models fromMorris -. I can do much more on the phone. JUST BELOW THE ITEM PRICE. ( Not for the J Type or JB and only for these Chassis Numbers ). ). Ford Transit MK1 Austin Morris BMC Sherpa Set of 4 Front Brake Shoes. Ferodo LS269 Pictures show what it fits. Please make sure that it is the correct part for your vehicle before buying. Please check the part number to make sure it is the correct part for your vehicle. New Old Stock. Packaging is tatty. UK postage and packaging is £7.00. Or can be collected from Blidworth. Notts. NG21 0PP. Part numbers are 27H4656 and 27H4657 upto 1974 fitted with 10" rims. 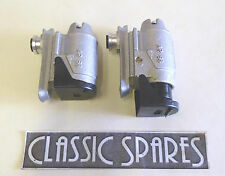 Here we have for sale 1x pair of classic MIni brake calipers. For RHD Cars. Morris Minor Series 3. These brake pipes are manufactured in copper and supplied cut to length and flared with brass fitting. (Copper Pipe with brass fittings). (C/W BRASS FITTINGS). Get rid of ALL your corroded brakes in one go. Morris Minor ( 1948- 62 Only ). Not for later Minors from 62 onwards which used 8" front drums. Here's a set ofFront & Rear Brake Shoes for the following models fromMorris -. I can do much more on the phone. Here's aBrake Servo Repair Kit & Instructions (Made in the UK) for theGirling Mk2a Servo fitted on the following models fromAustin / Morris -. As these cars are quite old they may not have the original servo still fitted -This kit is for theGirling Mk2a Type Servo, have a look at the picture. MORRIS MINI-MINOR. BRAKE LIGHT SWITCH. AUSTIN SEVEN MINI. Connects to the 2 way brake union. It should not be altered / tampered with/used. NOT included. Morris Minor. Morris Traveller. (x4)& Front Brake Hoses. Morris 1000. Morris Minor Van. Morris Minor Pick-up. (x2) for the following models fromMorris -. Here's a set ofFront Brake Wheel Cylinders. KIT WILL INCLUDE THE BRAKE PIPES FROM MASTER CYLINDER TO SERVO AND OUTLET PIPE FROM SERVO TO FRONT BRAKE PIPE UNION. I WILL THEN MAKE UP AND SEND OUT PIPES. THE SERVO BRAKE PIPES CAN BE MADE UP IN COPPER OR POLISHED CUPRO NICKEL. All new brake pipe ends will be used. PIPE SETS ARE ONLY SUITABLE FOR VEHICLES WITH THE STANDARD FACTORY SETUP. FULL SET OF COPPER BRAKE PIPES. ON REQUEST A FULL SET MADE FROM KUNIFER CAN BE MADE UP INSTEAD. MORRIS MINOR 1000 (1098cc) ; YEARS 1962-1971. Morris Marina AD028 AD073. " Bremskraftverstärker / Hauptbremszylinder / Servo Brake Booster Master Cylinder ". (geprüft, Bremskraftverstärker einwandfrei, Hauptbremszylinder sollte überholt werden!). Morris 10 (Ser. ( Not for the earlier Morris 10/4 and 10/6 made before 1936 ). (1936- 37). Here’s a set of(Front or Rear) Brake Shoes for the following models fromMorris –. I can do much more on the phone. ). MORRIS 10 SERIES M BRAKE HOSE SET (1939 - 1942). 2 FRONT AND 1 R EAR.